This product is final sale only. Note: This kit is cosmetically damaged. The item functions properly, however sections of the traveling case show scratches and a minor portion of the traveling case’s back rest has been chipped. 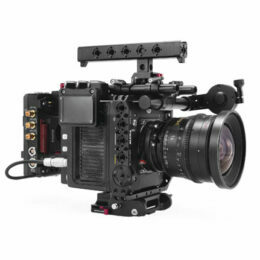 This advanced camera rig is designed for universal use with most DSLR cameras. It comes with everything you need for a complete camera accessories kit including a matte box, a follow focus, mounting points for accessories, a monitor arm, a top handle, handles and a shoulder pad for handheld operation, and a Sony VCT-UT14 compatible baseplate for tripod operation.